I’ve recently become obsessed with graphic t-shirts. Every time I see one with a cute phrase I have to purchase it. I love a good T-shirt that I can just throw on with jeans or dress up with a skirt and a pair of heels. The weather is starting to turn cooler in Atlanta and I thought this would be the perfect outfit for brunch with friends when paired with a leather jacket. The top is from J.Crew (Sold Out) and this skirt (on sale) is from Madewell. This J.crew “Salut!” top stood out because of its bold font and bright blue color. 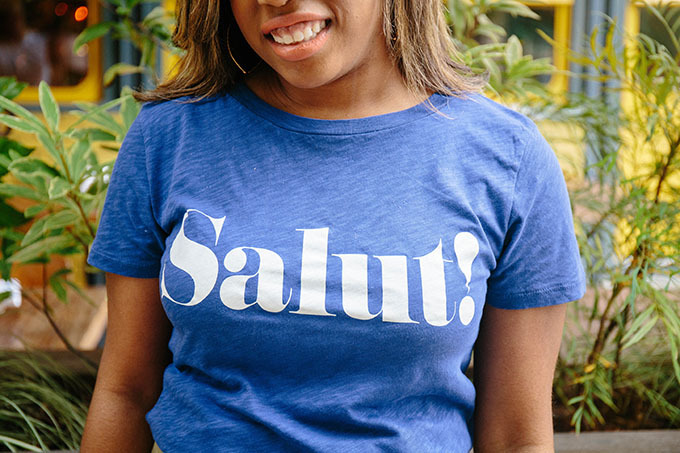 Salut means in hello in French and graphic tees are a great way to start a conversation or get a message across. Shop a few of my favorite graphic tees below.